Q: So, what is your book about? A: Short version? It’s about a young girl named Abigail who is trying to figure out her way through all that growing-up nonsense. Long version? Check out this page or the blurb. Q: I don’t get it. Is it a novel or a self-help book? A: Well, it’s kind of both. I had the hardest time figuring it out myself because all the characters are very relatable and nothing out of the ordinary actually happens to them. You know, no radioactive spiders or superheroes jumping all around in tights. Q: Ok, but seriously, is your book worth it? A: Totally! But then again, I’m kind of biased on that one so, you know what, give it a try. You can read the first four chapters FOR FREE right here. And on top of that, you’re getting an extra something. you know, just because. Q: Why should I buy your book instead of another one, like let’s say a Dr. Seuss’s book. They’re kind of part fiction, part self-development too, you know. A: Wow, let me stop you right there. You absolutely NEED to buy a Dr. Seuss’s book. Actually, you should even start with “Oh, The Places You’ll Go” and once you do, let me know what you think! Now, to answer your question, if you want to read a story where the character is kind of screwing up and makes you feel like someone you know (hint: you) then you should buy my book. The best part about it is that you will get an insight without all the patronising that usually comes with it. Q: No, seriously, you know what I mean. 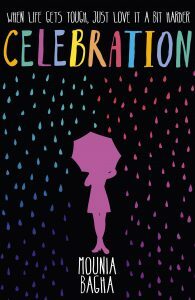 Is Celebration some sort of a memoir? A: Well, I’m not old enough (and probably not even interesting enough) for a memoir but yes, I have put a lot of my personal experiences and thoughts into Celebration and especially the character of Abigail. Actually, I realized that Abigail and her friends are like a lot of people I know and you probably know, too. I got deeper into the subject and all the thought process in the behind-the-scenes mini video series I created for the book. Q: How many books per year do you read? A: Definitely not enough, especially for a writer (she admitted shamefully).